Engineers David Christensen, left, and Elliot Hawkes, right, with their tiny robots. Imagine dragging a blue whale around on land without batting an eye. That's similar to the strength of tiny robots being developed by engineers at Stanford University. 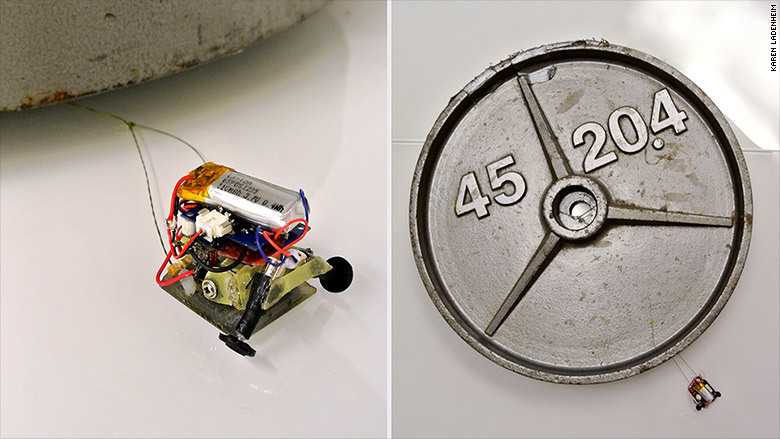 These micro-robots, which are about the size of a Matchbox car, can pull 2,000 times their weight. They come in two sizes, and the smaller one can even haul items up glass walls. 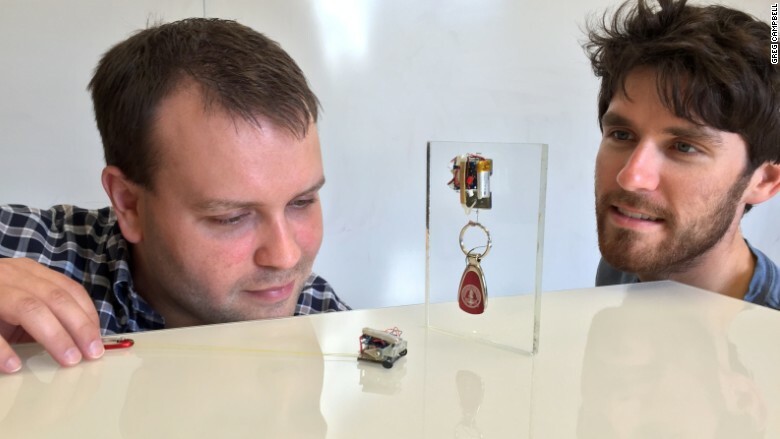 "These are the first micro-robots that are able to live in -- and manipulate -- a human-sized world," said David Christensen, who developed the robots with fellow Ph.D student Elliot Hawkes. So far, the robots have just been used in the lab to haul around weights, drag a full coffee cup across the table and move objects up a wall, but their strength does have some applications for the real world. The engineers said the robots could be equipped with CO2 sensors and then sent into a burning building to find survivors. Or, in less dire circumstances, they could be used to put objects in out-of-reach spots -- like a wireless router in the rafters of a factory. Christensen said the robots should be thought of as a little army that can be deployed, and since they're cheap to make -- each one only costs about $20 -- it's not a big deal if one goes missing. "You can make hundreds of them and you don't care so much about breaking one or losing one because they become disposable," said Hawkes. He and Christensen can build a new robot in just a day or two in the lab. They use 3D printers to make the parts, which has sped up the process. This robot, officially called the Ground MicroTug, weighs 12 grams but can pull 2,000 times that amount. When designing the robots' movement, the engineers were inspired by geckos and ants, whose feet adapt when they climb or carry a load. To haul an object, the robot first drives forward on its two front wheels, and then plants itself on a hard surface and pulls on a string attached to the object. It continuously repeats the process to move things forward, and can keep going as long as there isn't anything in its way. The robots' "feet" have spikes that stick to the ground, much like a gecko. The robots are still a work in progress and have only been in development for a few months. They will be on display next month at the International Conference on Robotics and Automation in Seattle, Wash.
"What we're trying to prove is that we can do amazing things like ants can do," Christensen said. It's hoped that the tiny robots will one day work just like ant colonies, which work together as a team to get things done. Ants are especially impressive when it comes to weightlifting -- a regular ant can lift up to 5,000 times its own body weight. "If I have an ant crawl on my hand, you realize how awesome they are," Hawkes said. "They are beautiful little things."